← Can Gilead Produce A Beat In Upcoming Q2 Earnings? 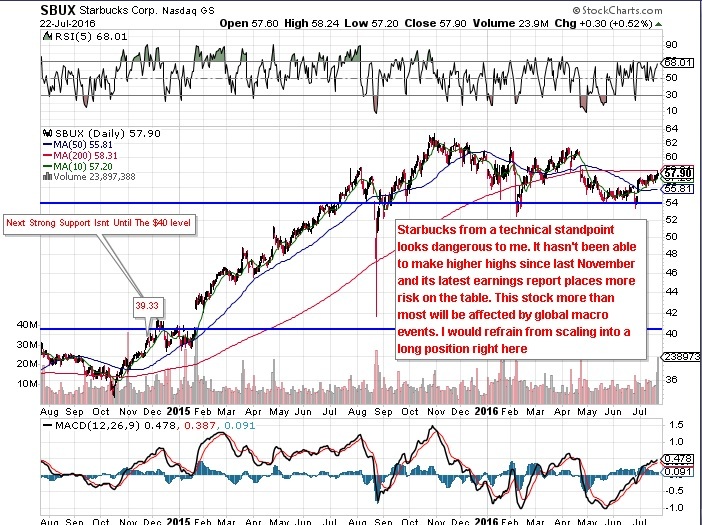 Starbucks (NYSE:SBUX) from a technical standpoint looks dangerous to me. It hasn’t been able to make higher highs since last November and its latest earnings report places more risk on the table. This stock more than most will be affected by global macro events. I would refrain from scaling into a long position right here. The stock has strong support at $54 but not very much underneath. Its elevated valuation could all of a sudden come down to size if things do not pick up in the next few quarters. This entry was posted in Stock Picks and tagged sbux. Bookmark the permalink.